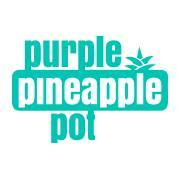 You must be wondering what is Purple Pineapple Pot? Purple Pineapple Pot is a platform offering one day, quick learning workshops, dealing with basic knowledge in any field suggested.Their lessons are delivered in an original, entertaining and informative way that fulfills the workshoppers’ interests. The workshops cover a wide range of subjects to anyone and everyone who wants to add something new to their life. Whether it is a skill, hobby, activity or just extra information for everyday use. Workshops will be given repetitively every weekend for a period of eight weeks. When the eight weeks pass, a new batch of topics will be available. However some workshops might be prolonged depending on customer demand. The workshops are taking place in several venues, depending on space, subject, and location. This week’s workshop is about Bartending and it will be this Sunday, February the 2nd at Cargo Bar Mar Mkhael. 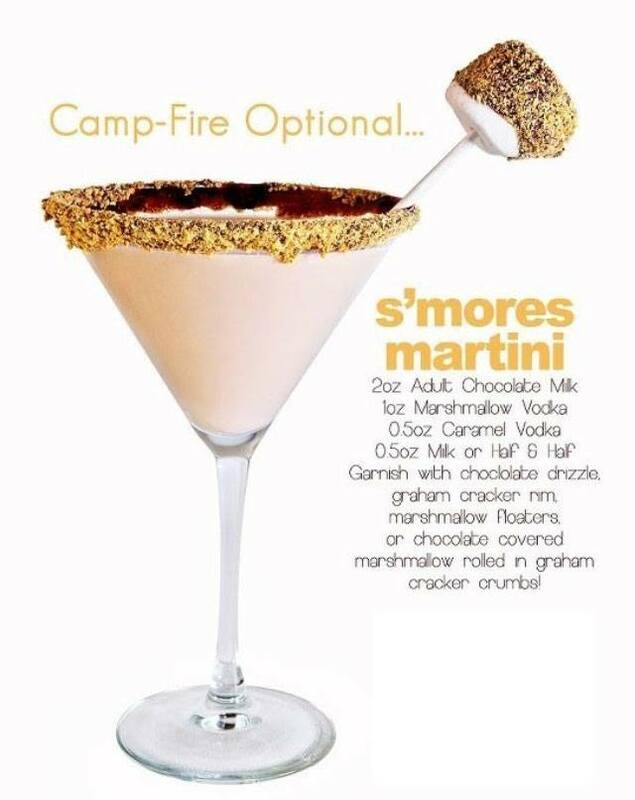 Create your own drink by following the instructions. 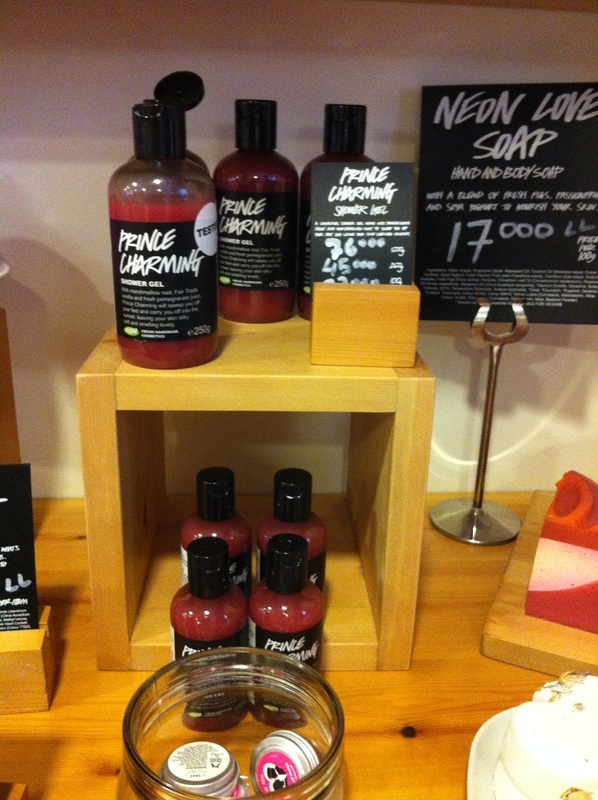 Get in the mood for love with this collection of new LUSH creations especially for Valentine’s Day! This year sees a fun and quirky take on Valentine’s Day, with inspiration ranging from romantic love songs written in neon and Adam and the Ants, to Tom Cruise’s Hawaiian shirt in Cocktail! We wanted to make our Valentine’s collection sharable, or just last longer for one, so we’ve made the products bigger than ever, but still lovingly made by hand with the same high quality ingredients and essential oils. The Love Locket was inspired by the kind of heart-shaped locket you wear as a necklace, perhaps with a secret photograph of a loved one inside. 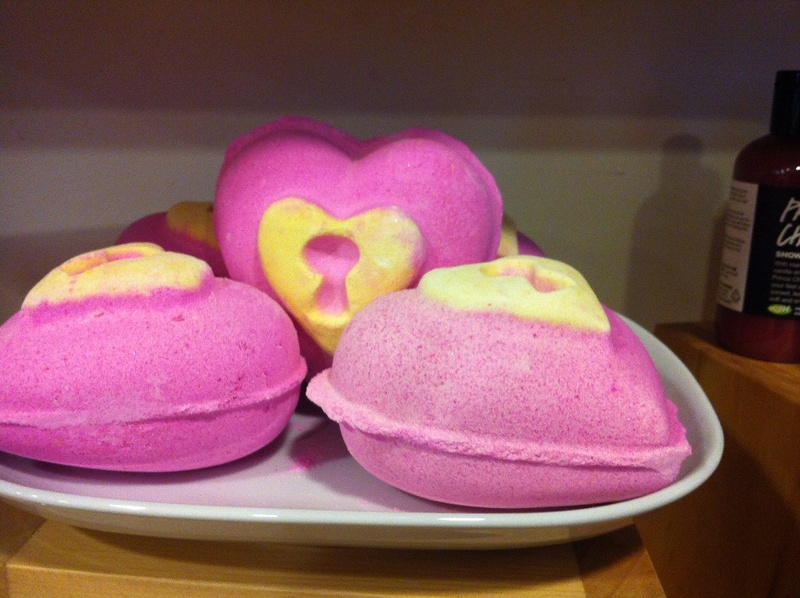 Like any love locket, you need to unlock the bath bomb to reveal the secret hidden within. Crack your locket in half, to unveil the hidden heart in the center. The outside of the locket is full of paper hearts that will float out onto the surface of the water, while the hidden heart inside is laden with agar hearts to create a spectacular bath time display. Use each half and the inner heart individually (so three baths in total), or throw it all in the bath tub at once for a really decadent bath, enough to get any heart aflutter. The brand new fragrance is made from some of our most luxurious essential oils: Fairtrade vanilla absolute, neroli oil and jasmine absolute are blended to create a sweet, sensual and uplifting indulgent bath time. Inspired by 12 Months of Neon Love, a collaboration between artists Victoria Lucas and Richard William Wheater, beginning on Valentine’s Day 2011 and ending on Valentine’s Day 2012. The art featured lyrics from well-known love songs, in huge neon writing! 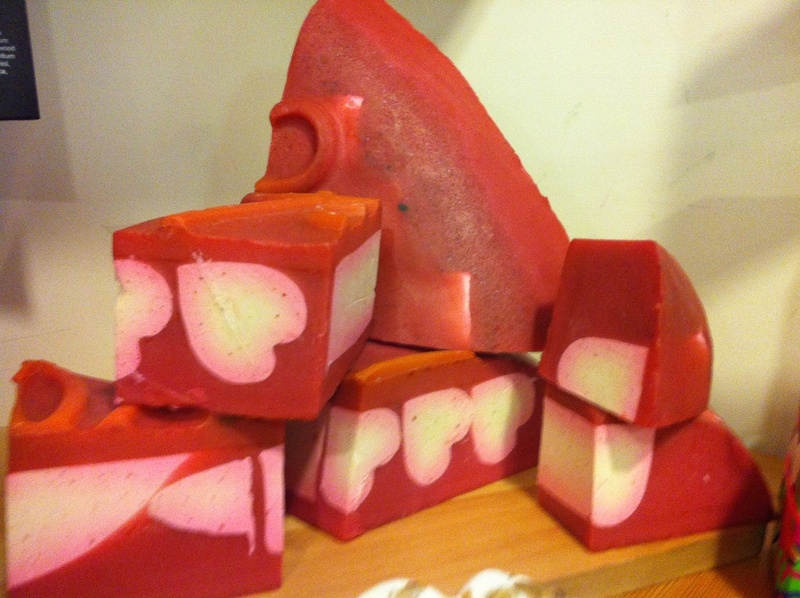 This huge heart-shaped soap, emblazoned with the word ‘Love’, is scented with a brand new fragrance of bergamot, rosewood and cinnamon leaf oil and packed full of fresh ingredients, such as fresh figs, passion fruit juice and soya yogurt to nourish and soften the skin. Hiding inside are plenty of little white hearts to ensure every slice looks as beautiful and romantic as it smells. 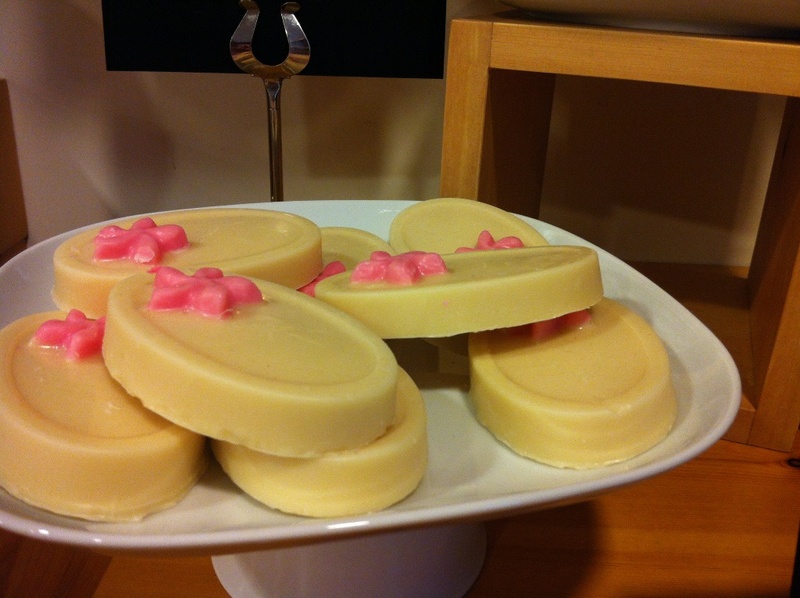 This smooshable massage bar was inspired by the humble jammy dodger. As you peek through the heart-shaped hole on top of the bar you can see into the sumptuous white fondant center. Made with a luxurious blend of butters and oils, including cupuaçu butter, Shea butter and olive oil, this rich bar shares the same delicious vanilla fragrance as in Rock Star soap and Creamy Candy bubble bar. Guaranteed to bring someone special Close to You! A shower gel made for princesses and for anyone who needs a Prince Charming in their life! This sweet-scented, neon pink shower gel is fit for royalty. Marshmallow root and Fair Trade vanilla pod decoction forms the base, giving a very soothing experience, boosted by nourishing almond oil and cleansing, cooling and astringent fresh pomegranate juice. Prince Charming has a new fragrance of organic sandalwood, geranium and grapefruit essential oils to sweep you off your feet and leave you skin silky soft and smelling lovely. I always had a problem with the dark circles around my eyes, although I apply eye contour cream every day to moisturize, and do eye contour masks from time to time. Aellas is a professional peeling line for Eyes, Face, Neck, Hands, Sensitive Areas and Body. That means, it’s not the type of treatment that you do at home, you have to ask your beautician or your doctor for it. 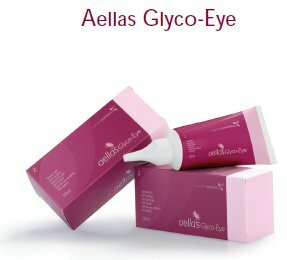 And I had the chance to test the Aellas Glyco-eye, which is the only specific periocular (area around the eyes) peeling product in the market. After cleaning the skin, the first step was the pre-peeling by using the Aellas Ready N: skin preparation for normal and oily skin types (Since this is my skin type). Then the beautician removed the product with Aellas Clean and dried my eyes before applying the peeling product. Then she applied the Aellas Glyco-Eye, during this step the beautician was monitoring the skin color change and the sensations I was feeling and then she proceeded with the neutralization, by using the Aellas Calm, the color changed from transparent to fuchsia, and I had the sensation of tingling and itching, as if I wanted to scratch my eyes, but of course, your eyes should be always closed! She kept the product for around 5 minutes and removed it with Aellas Clean and as a post treatment she applied the Aellas Nourish, and before leaving, she certainly applied sunscreen, which I had to keep on applying for three days afterwards and no spending time under the sun. My friends started noticing that my eye contour area became much whiter than before, but of course with only one session, this is not the final result wanted. To reach the final result, with really clear white eye contour, I need 4 to 6 applications. Have you heard about this brand before? Would you consider having a chemical peel? I have been fascinated by the jewelry world a lot lately and discovering new brands. My latest discovery is AGATHA Paris: the iconic French jewelry brand that fuses the fashionable with the affordable. Founded in 1974, AGATHA grew from a Parisian design store to a worldwide fashion jewelry company with over 400 retails outlets all over the world. And this Valentine’s Day, there’s a thousand and one ways to say ‘I love you.’ AGATHA, is saying ‘I love you,’ ‘Te quiero,’ and ‘Je t’aime’ in pendants and openwork cuff bracelets that repeats these words of love like mantras. Heart-shaped pendants whisper ‘Je t’aime.’ Always an elegant way of proving one’s feelings. AGATHA‘s band rings can be combined, mixing delicate motifs and different shades of gold. 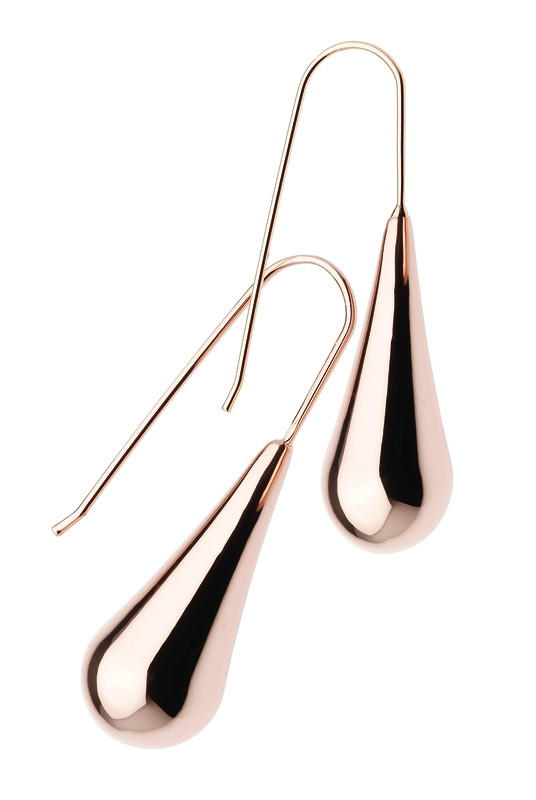 Beautiful drop earrings come in metal, pink, silver and gold colour. And to tie a love knot, what could be more romantic than composing your own Agat’You heart bracelet for your valentine. 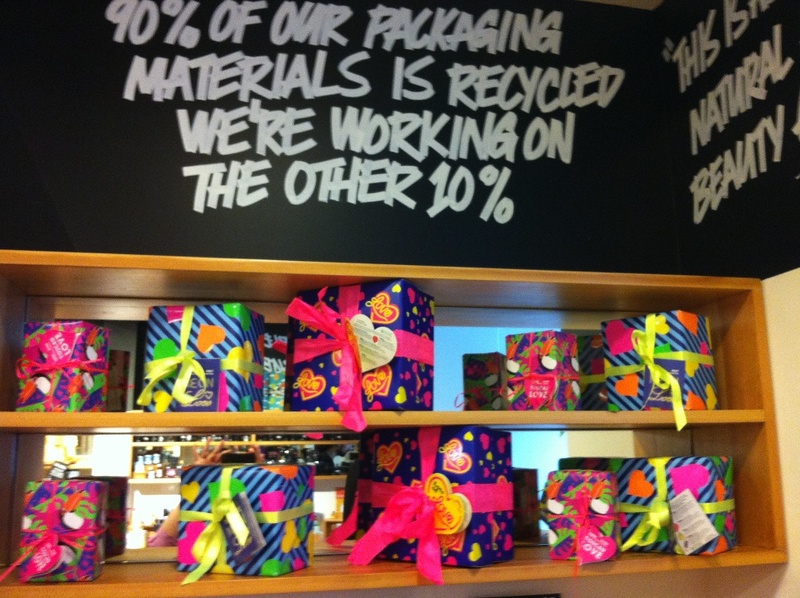 What do you think about their Valentine collection? This section will be dedicated to my favorite celebrities and they’re awesome outfits. Today I’ll be presenting Matthew Mc Conaughey‘s outfit that he wore, to attend the 19th Annual Critics’ Choice Movie Awards at Barker Hangar on Thursday, January 16th, 2014 in Santa Monica, California. Matthew McConaughey, Critics’ Choice Best Actor nominee for his work in “Dallas Buyer’s Club,” was wearing LANVIN – silver silk textured houndstooth tuxedo with black satin peak lapel, black silk pant, white tuxedo shirt, black silk “Bristol” bow tie, and silver “Sartorial” cuff-links. 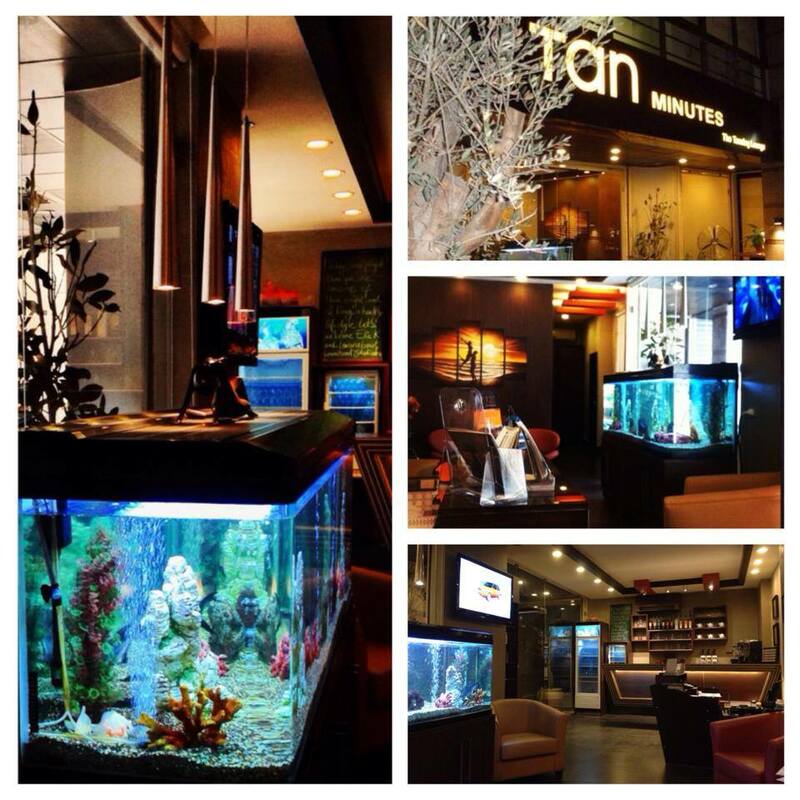 The people who know me well, know that I’m not much into tanning, and it’s right, but my purpose of the visit wasn’t just to check their latest in tanning machines and products, but to check their customized fitness program while tanning. Their machines have a double feature, they give you the glowing tan you want while shaping your body, the way you want, in just 10 minutes per session and without doing any effort! The fitness machines provide different programs, from working on cellulite, water retention, slimming, muscle-building, depending on each body. I had the chance to try the body draining session, all i had to do is to stand for 10 minutes, while the machine does its magic. It changes levels by itself, you just have to relax and enjoy your favorite music. Time passed in no time, and I could feel new muscles working, that don’t usually work during normal workout at the gym. It’s a kind of passive workout, that is relaxing and gives you the results you need after the number of sessions required. And don’t forget to check their Facebook page, for the funny posts and information.